The district I work for is piloting a laptop program this year. Each school was allotted a number of carts, depending on the student population. 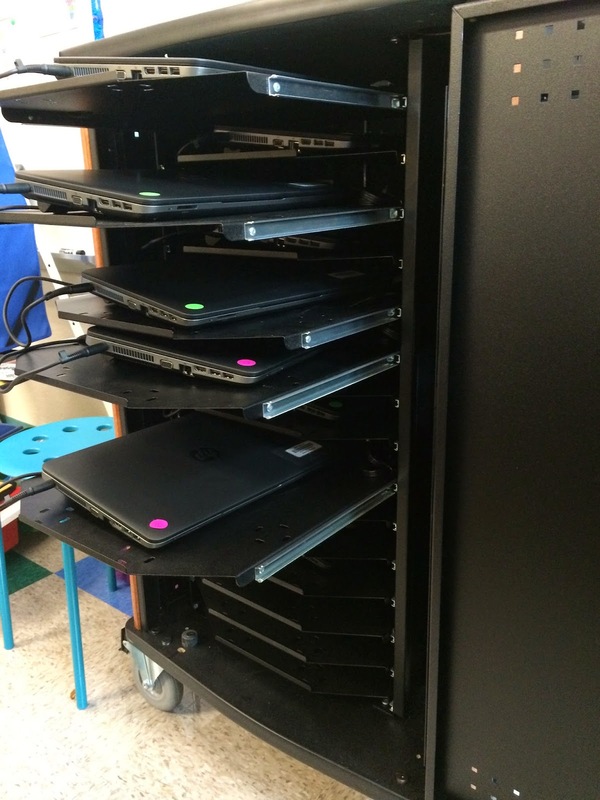 The carts hold 12 laptop computers. The aim of the program is for a 2:1 ratio to enhance project based learning. 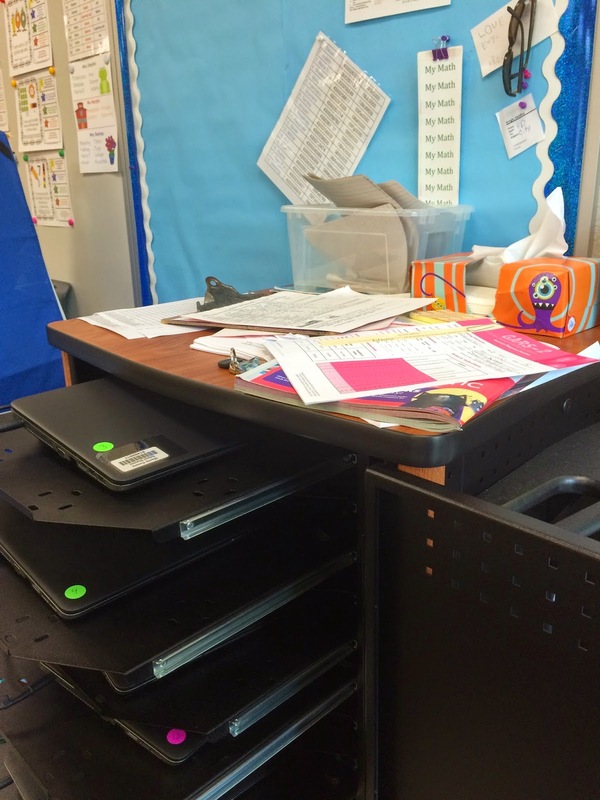 Teachers had to apply for the laptop carts. I was lucky enough to be chosen! I am so excited about the program. Yes, I teach Kindergarten. Yes, there are obstacles to overcome. Yes, there are days the technology doesn't work. Yet I am still excited. All the schools were outfitted with Wi-Fi access over the summer. Remember those obstacles... Well, the student logins didn't work for the first few weeks of school. That is behind us. Except the Wi-Fi network went down last week for 4 days. Window authentication problems; that has been fixed now as well. Logins themselves are another obstacle for Kindergarten; numbers, letters, capital letters, etc... make it challenging. However, my kiddos are starting to get the hang of it all. I have several who can login with no help at all. Baby steps. My goal is to be at 80% by December. I know I have a couple kids who may need help all year. That is just fine. I am fortunate enough to have 6 desktops in my room. Combine those with the 12 laptops and I am at a 1:1 ration. (Yes, I only have 18 students) This ratio is much better for my class. The kids don't have to log out and login when they get to a computer, I can have Google Chrome save the anonymous passwords. Ones I create for sites like www.internetbuttons.org or Education City; nothing that is tied to their district information. Right now we are using our laptops to enhance our learning. My small group time is a digital rotation. The centers are as follows: teacher, computer, iPods, library (which as a Nook color), learning games. I have an aide during centers, she helps with logins and works with the kids at the learning games. I will be talking more about all my digital centers throughout the year. I am still tweaking the whole idea. I plan to incorporate Voice Thread and ActivInspire for digital storytelling. I have the iPods and Nook which can be used for different activities as well. Stayed tuned to hear about our progress. There is a downside to the laptop cart. The cart itself. It sits directly behind my teacher computer. It has a nice large flat surface. Seeing that I am a pile maker, not a filer, it regularly has lots of papers on top of it. Oh well, at least I can find the stuff. 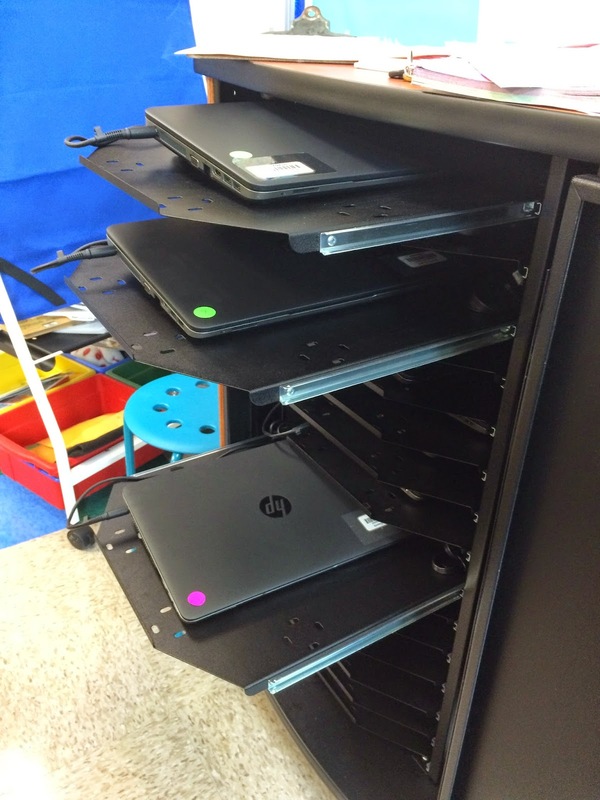 It is good to know when people see their wishes getting true, in this post a teacher got succeeded in getting a cart of laptops. It was really nice to know!